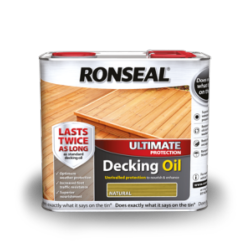 Our Ultimate Protection Decking Oil nourishes the wood, giving it a beautiful natural finish. More importantly, it lasts twice as long as any other Decking Oil. It's tough against the weather and stands up to wear and tear. Our oils can be applied to all types of decking, smooth and grooved, softwood and hardwood. By replacing the natural oils lost during weathering it prevents cracks, splitting and warping. Don't like the colour light oak think ill go for dark oak next.